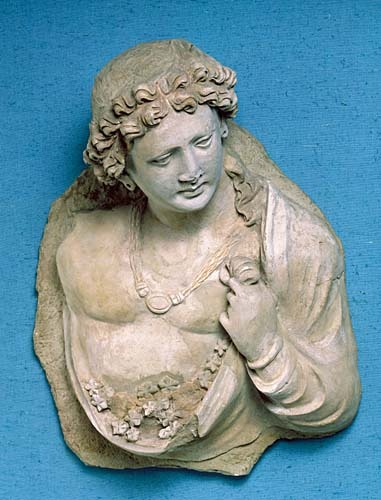 This sculpture, a three-quarter bust with gently inclined head portrays a young man holding a lapful of flowers. His elegantly profiled oval face with its high brow and full cheeks is framed by flowing, curly locks of hair and displays northwestern Indian influences. Representing a deva , or a spirit, it provides a perfect illustration of that combination of Hellenistic revival and resolutely Indian plastic art, which is typical of the stuccos discovered at the Hadda site, a complex style characteristic of the eclecticism of this Afghan school which was influenced by the Gandhâra style. The piece was originally one of a matching pair, and the spirit figures were shown tossing flowers in homage to a large Buddha.The execution involved a stucco technique believed to have been introduced from the Greco-Roman workshops of Alexandria. The deity projected from a wall, and was progressively sculpted from barely suggested low relief to almost total high relief, employing an illusionist method inherited from Greece and found in Bactria from the Kushan period. The figure comes from a decorative niche in the courtyard of one of the two stupâ erected inside the Tapa-kalan monastery at Hadda, a renowned centre of pilgrimage. Such monasteries consisted of several cells and interior courtyards in the middle of which stood a stupa. The walls of the shrines were lavishly decorated with scenes from the life of the Buddha which featured numerous figures in a variety of poses representing minor divinities, including this celebrated Spirit with Flowers. The outstanding realism portraying the range of ethnic types from northwestern India, the quality of the facial modelling, and the refined delicacy of the Hadda school fully justify its pre-eminent place among the different “Greco-Buddhist” workshops.